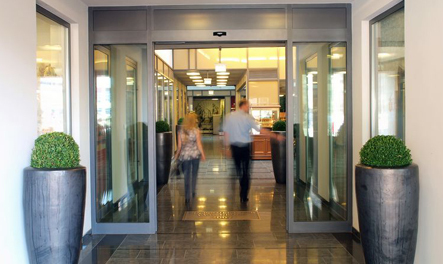 Automatic Swing Doors and Automatic Slide Doors with controls and sensors to keep those with mobility access difficulty in mind. Those in wheelchairs need to be considered where access and egress are concerned. Everything about getting through that doorway needs to be easy and straightforward. Correct height elbow bump pads on the wall; Correct height push buttons on the wall or on a post. It takes adequate consideration and attention-to-detail and due care. At Progressive Controls, we do these things well. Click here to learn more.